Agent Ashley H.K. 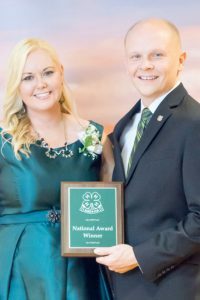 Stewart received the Achievement in Service Award from President Shawn Tiedi at the 2017 National Association of 4-H Agents Annual Conference in Indianapolis, Indiana. Highlands County has a new 4-H Agent and she’s pretty awesome from what I’ve been told. My name is Ashley Stewart and I hope that I can live up to all the wonderful things that have been said about me coming back to Highlands County. That’s right, I said back, as I am a Highlands County native. Allow me to tell you more about myself and how I hope to grow the Highlands County 4-H program. I graduated from Sebring High School in 2004, where I had spent years participating in the Varsity Choir, Student Government, Key Club, FFA, and playing on the Varsity Soccer team. From there I went on to obtain my BS in Family, Youth, and Community Sciences from the University of Florida. Upon graduation I chose to remain in Gainesville working for both the Levy County Extension Office as a 4-H Youth Counselor and as a Family Liaison Specialist for the School Board of Alachua County. It became very clear to me that my heart was in 4-H and I decided to return to school to pursue the dream of becoming a 4-H Agent. In the Spring of 2013, I accepted a 4-H Agent position in Marion County and graduated with my MA from Liberty University with a degree in Human Services: Marriage and Family Counseling. I have spent a total of 10 years working for 4-H with the past 5 as an Agent. During this time I have worked with the Department of Juvenile Justice to work with at risk youth in underserved communities, served as an ATV Safety and Shooting Sports instructor for shotgun, riffle, and archery programs. I’ve worked with key stakeholders in the community to increase funding to support 4-H programs. I have also established great partnerships with the Marion County Public School System, Boys and Girls Club, Monroe Regional Hospital District, and School District Extended Day Program to expand program offerings. But what I’ve spent the majority of my time doing is creating a STEM program area that did not previously exist in Marion County. I’ve created STEM program that focus on nontraditional 4-H projects. I’ve held workshops and day camps to teach youth about rocketry, robotics, computer science, coding, electricity, and circuitry. I started a competitive First Robotics Team (which placed 4th overall this past season) as well as a SeaPerch Underwater ROV team (which placed 9th overall). I’ve worked with over 3,000 youth annually through school, community, and special interest clubs, after school programs, day camps, residential camps, 4-H University, and competitive teams. Through these programs, I’ve been able to enhance the STEM abilities of the youth that I have worked with and make subjects like science and math less intimidating. I’ve been able to expose youth to the opportunities that they would not have been able to experience otherwise and spark their interest in STEM related fields. I’m excited to have the opportunity to expand the Highlands County 4-H program so that we may be able to offer programs to all youth regardless of their interest or their location. I look forward to having a program that offers both traditional agricultural programs as well as nontraditional programs like robotics. I look forward to having a program that will teach youth in the community where their food comes from and how they can grow it. But most importantly I look forward to raising my son in the community that shaped who I am and in a 4-H program that has the strong support of its community.